Mangalik Yoga or so-called Mangalik Dosha. It is one of the most infamous Yoga of Astrology, kind of feared one. There are misconceptions that this type of Yoga creates troubles in married life, breaks the marriage and blah blah blah and there are numerous remedies by which, it is claimed that this so-called dosha is removed. Then there are other theories which say that if Mars is in its own signs or exaltation sign or signs ruled by its friend planets, then this yoga gets cancelled. Let's see what it actually is and how does it work? 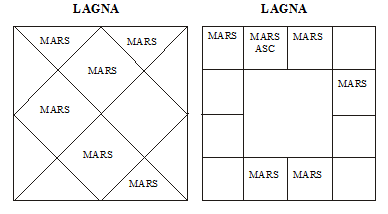 So, Mangalik Yoga happens when Mars is placed in 1st, 2nd, 4th, 7th, 8th and 12th house in Lagna Chart. Why these houses specifically? Because from these houses Mars impacts the results of 7th house of marriage and marital happiness and 8th house of in-laws, either by sitting or aspecting these houses. For 2nd house, there is differences of opinion between South Indian and North Indian Astrologers. South Indians include Mars in 2nd house as a Mangalik Yoga whereas North Indians don't. In my opinion, it should be included in Mangalik Positions, for the simple reason that 2nd house is itself a house of family. As I described Mars earlier, Mars is considered as soldier in Astrology. Soldier's basic nature is to be aggressive. When Mars aspects or sits in 7th or 8th house, it brings that aggressive nature or anger into marriage and obviously, other person won't like it for a long time. It will lead to arguments and unhappy married life overall. But this is only half truth. As Mars is a soldier, soldier's main job is to protect its land. So, Mangalik people are actually the most protective people on earth when it comes to their relations if Mars is in good dignity. Another thing is that, like any other planet, Mars also has its maturity age. Its maturity age is 31 years and from 28 years of age onwards, it starts releasing its aggressive nature. The best thing for a Mangalik person is to marry another Mangalik person, if marriage is taking place before 31 years of age, that's where Mars energy gets cancelled with each other. If Marriage is after 31 years, Mars is matured. Aggressive effect of Mars is no more there. Now, about cancellation because of Mars in its own signs, exaltation signs or friendly signs? Again, nothing gets cancelled totally. Mars energy will need another chart's Mars energy for cancellation, in same chart it won't get cancelled. What things help even if marriage takes before 31 and with a non-mangalik? In my experience so far, Jupiter's Mahadasha or Jupiter in 6th house saves the marriage, even if a Mangalik person marries a Non-Mangalik before 31 years. Why 6th house? Because 6th house is house of disputes, Jupiter sitting there will prevent person from having any dispute and thus saves the married life. So, basic thing is that it is a good yoga to have. Mangaliks are most protective people. Marry another Mangalik, specially if it is before 31 years.